This "alcohol etching" technique was created while working on a card challenge. It's extremely simple to do, and couple of practice sessions will make you a pro!! Note - those with sensitive noses may want to have a fan blowing because of the use of ethyl rubbing alcohol that is used for this technique. 1) Using the repositionable double-sided tape, adhere your transparency sheet onto your scratch paper. 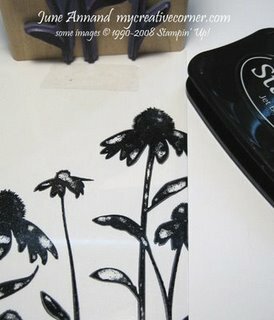 Stamp your solid stamp image in Staz-On ink onto your transparency. Don't worry about any areas with ink that doesn't transfer. Give it a few seconds to dry. 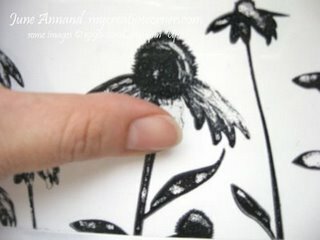 Here I used the coneflower from Inspired By Nature stamp set. 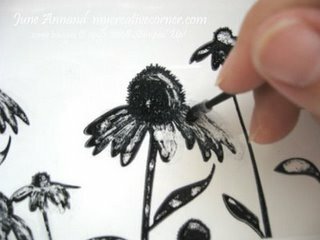 2) Dip your tiny tipped sponge applicator into the alcohol and begin rubbing areas of ink that you want to remove. You know, maybe even one of those flat toothpicks would work for this... 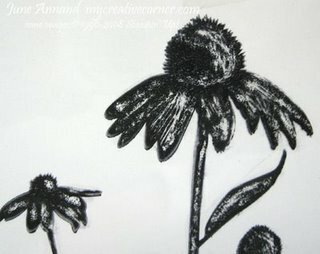 I say this because I ended up trimming the very tip of the sponge off the applicator and used the plastic tongue that was inside to scrape the alcohol-moistened areas on some parts of the coneflower.... so I used the spongy part to remove ink from larger areas and the plastic to scrape and create lines. Notice that little grey shading directly under my fingers? That's from the little bit of alcohol dissolving/removing Staz-On from that area of the image . And, there you have it - your alcohol etched image! 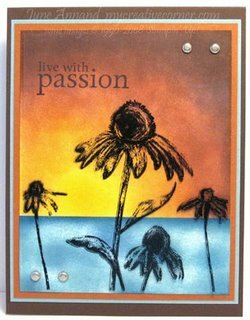 The background was created by using a post-it and sponging my sunrise and ocean onto Whisper White cardstock. I stamped the sentiment in the upper left corner and added the finished transparency. Finally, brads were inserted and this was layered a couple times before adhering to the card base.